A new alternative to bike chains is appearing in the market: grease-free, ultra-tough belts. Lighter, cleaner, and more durable than traditional metal chains, expect to see them on an increasing array of consumer models in the coming years. Traditional bike chains can be nasty, greasy magnets for dirt and funk. Proper care and maintenance helps keep this to a minimum but you still need to use some type of lubricant to keep them running smoothly and efficiently. And no matter how well you care for them, eventually they break or wear out and require replacement. Belt systems use no grease and manufacturers claim that they last anywhere from 2 to 10 times as long as a traditional chain. A belt drive train can also be significantly lighter, as much as half the weight of a traditional chain drive system. Belts do have some drawbacks that require specific design elements on the bike. Unlike a traditional chain, which can be opened up for installation, belts are closed bands. 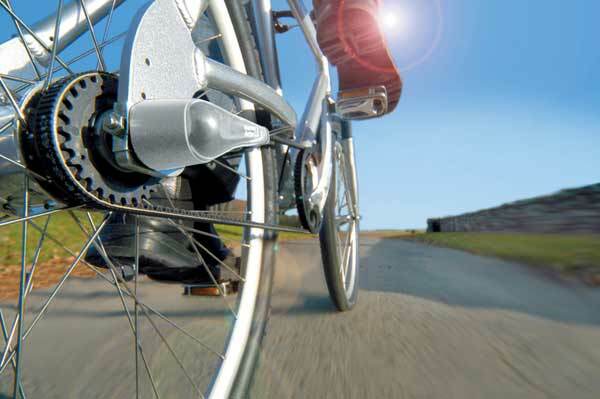 Consequently, a slot must be designed into the bike frame that allows the belt to be positioned onto the drive train. (Here’s a photo sequence showing this.) This also means that belt-driven bikes have to be designed from the get-go with this in mind—no retro-fitting your chain bike. Belt systems are also designed primarily for a single-speed set-up, though as the technology develops you can expect to see multi-gear options in the future. A handful of companies are currently producing this new technology, including Foxborough, Mass.-based Cycle Drive Systems and Colorado-based Gates Corporation (a huge industrial company, including a small bike division, Gates Carbon Drive). There’s also good overview of the trend in this recent New York Times article. Bike designers can purchase a complete belt-drive system for $150 – $300. Consumers should keep an eye on 2011 product offerings—more than a dozen bike manufacturers are including at least one belt-driven option in their line-ups.